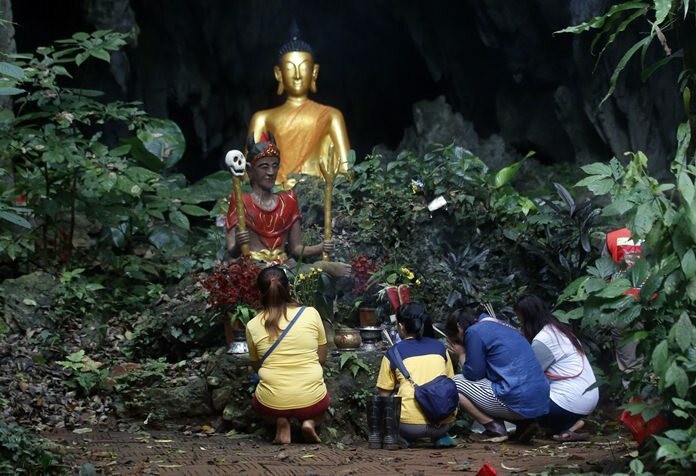 Mae Sai, Thailand (AP) – The youth soccer coach trapped in a partially flooded cave in northern Thailand with 12 members of his team apologized to their parents last week in the first letters they sent out through divers, with the boys saying (at the time) they’re doing well and missing their families. The local governor in charge of the mission to rescue them said Saturday, July 7, that cooperating weather and falling water levels over the previous few days had created appropriate conditions for evacuation, but that they wouldn’t last if it rained again. Chiang Rai acting Gov. Narongsak Osatanakorn said rescuers are “at war with water,” and that experts told him flooding from new rain could shrink the unflooded space where the boys are sheltering to just 10 square meters (108 square feet). There are also concerns about the percentage of oxygen in the air at the boys’ safe space falling, and carbon dioxide content increasing, posing a serious health hazard. 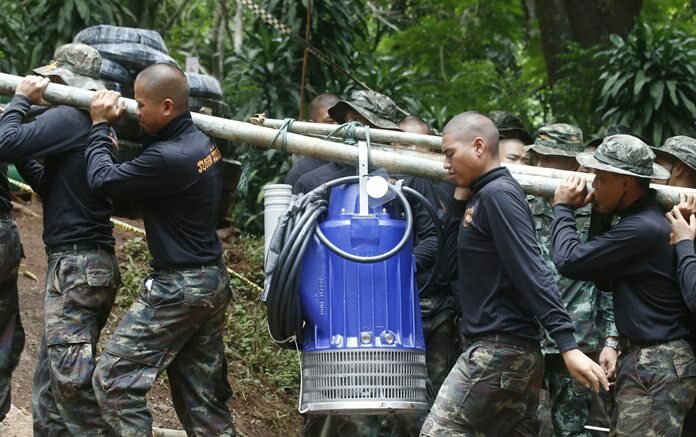 The boys and their coach are accompanied by several Thai navy SEAL divers. Rescuers were unable to extend a hose pumping oxygen all the way to the boys, but brought them some oxygen tanks. 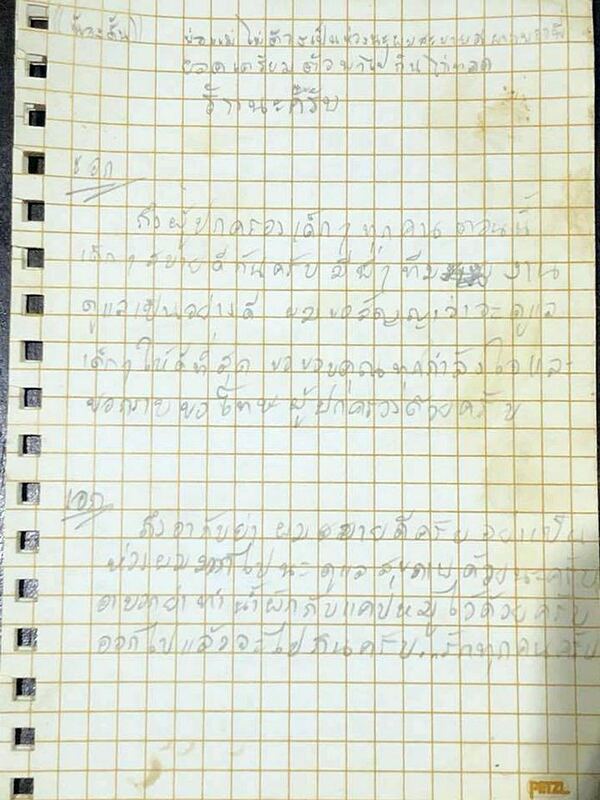 Divers Friday night, July 6, brought out poignant letters written by those trapped inside. 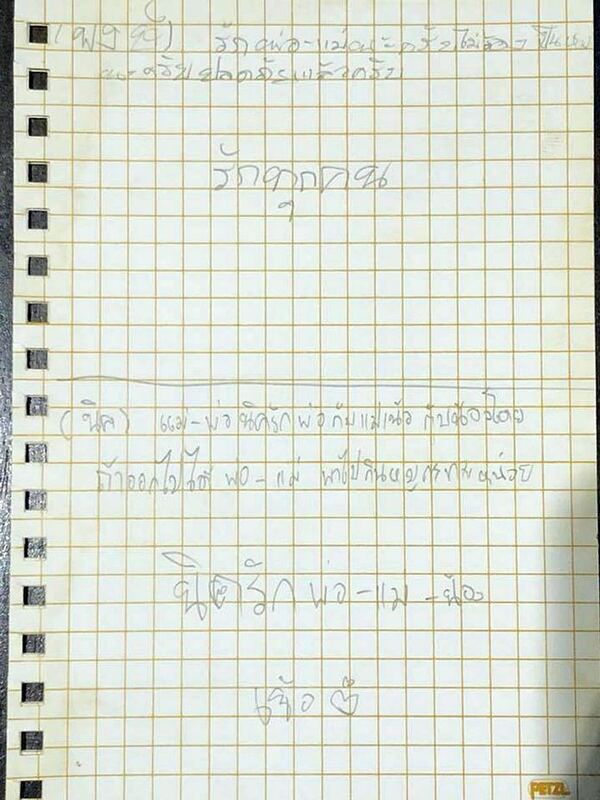 Another, identified as Tun, wrote: “Mom and Dad, please don’t worry, I am fine. I’ve told Yod to get ready to take me out for fried chicken. With love.” The name reference could be of a waiting relative. 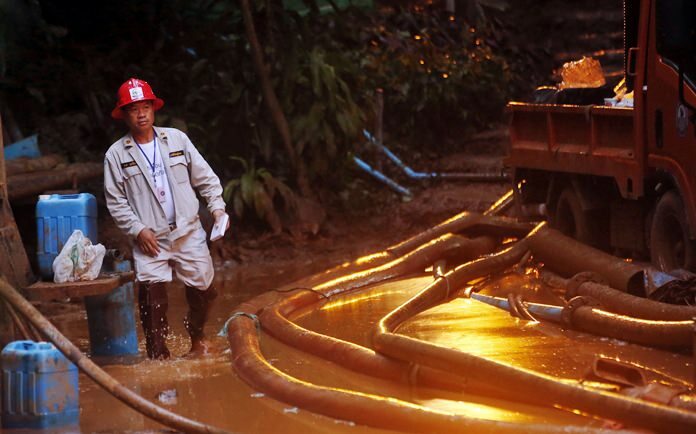 Rescuers pursued other options to extract the boys, hoping that finding a shaft or drilling into the mountain in which the cave is located would lead them to a sort of backdoor entrance. Authorities were waiting for two big groups of volunteer foreign divers to arrive later Saturday and Sunday, after which they would be ready to act quickly to bring the team members out when the conditions are right, said Gov. Narongsak. “The plan that I’ve held on to from the beginning is that we have to bring the kids out and the determining factor of this plan is to have as little water as possible,” he said, adding that floodwaters have been drained as much as possible. 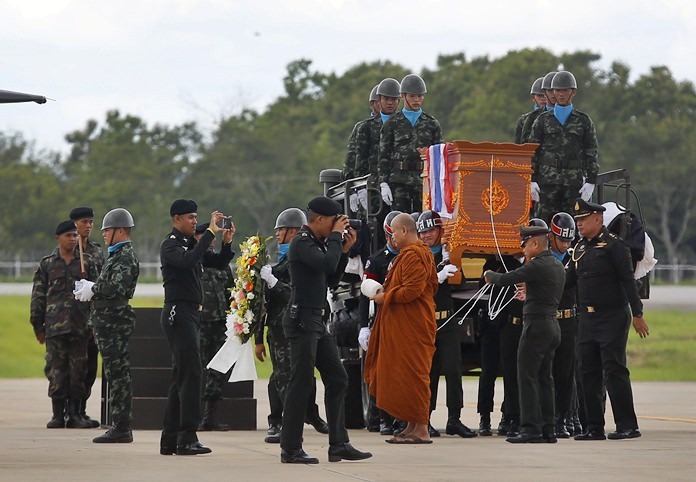 The death last Friday of a former Thai navy SEAL, Saman Gunan, underscored the risks of making the underwater journey. The diver, the first fatality of the rescue effort, was working in a volunteer capacity and died on a mission to place oxygen canisters along the route to where the boys and others sheltered. The strategically placed canisters allowed divers to stay underwater longer during the five-hour trip to reach the stranded team. 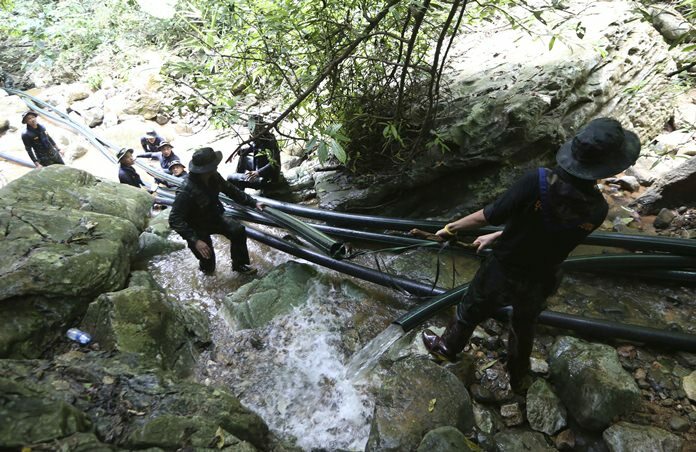 Late Friday, July 6, Narongsak ruled out any immediate rescue attempt, saying the boys “cannot dive at this time.” He said the boys were still healthy and had practiced wearing diving masks and breathing in preparation for the diving possibility. 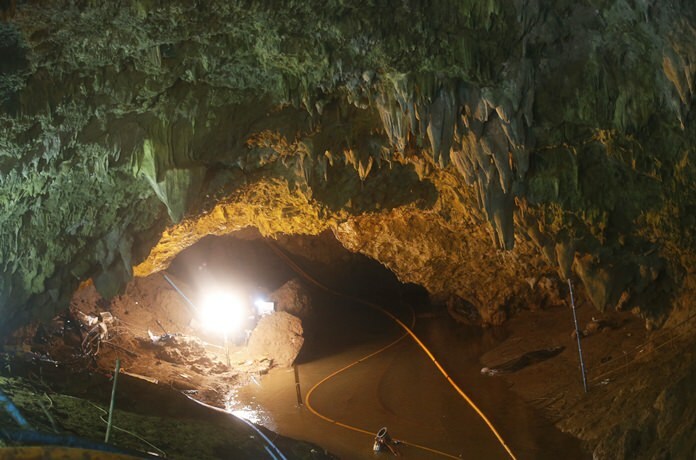 Cave rescue specialists cautioned against an underwater evacuation except as a last resort, because of the dangers posed by inexperienced people using diving gear. The path out is considered especially complicated because of twists and turns in narrow flooded passages.